Responding to Slavenka Drakulic’s recent Eurozine article on the situation of women caught up in the post-’89 transition, Kristen Ghodsee and Adriana Zaharijevic reconsider notions of “emancipation from above” and the grassroots participation of ordinary women in both the East and the West. Once upon a time in western democracies, women banded together and rose up to defeat their patriarchal oppressors. They linked arms and pumped fists, setting aside their differences in race, class, religion and ethnicity. This band of glorious sisters demanded equal rights, economic opportunities and reproductive freedoms. Democracy empowered women to speak out for their rights, and after years of hard struggle, western women triumphed. Democratic governments had no choice but to cave in to this grassroots activism, born of community organizing and feminist solidarity. 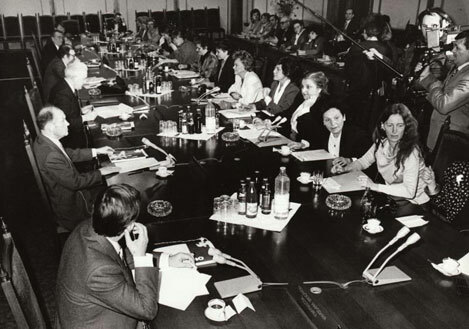 A meeting between the leaders of women’s organizations in NATO countries with the Ministers of Defense of the nations in the Warsaw Pact. Sofia, 1988. Photo: By permission of Elena Lagadinova. Once upon the same time in eastern Europe, male communists seized power and established totalitarian regimes. Newly empowered red patriarchs required women’s labour to build the bright communist future, and so they embarked on a sustained programme of emancipating women from above. Faceless Party cadres in the Central Committee and the Politburo devised policies and programmes to ensure the legal, social and economic equality of men and women. Eastern European women embraced the new educational and occupational opportunities made available to them, as well as the various legislative protections and state entitlements to help them find balance between their personal and professional lives. But eastern European women never valued these rights, because they fell into their laps from the sky. One cannot appreciate what one has not fought for. These are simplified fairy tales, but they are myths that seem to underlie the 5 June 2015 article by the Croatian feminist, Slavenka Drakulic: How women survived post-communism (and didn’t laugh). Slavenka Drakulic refers us back to her 1992 book, How We Survived Communism and Even Laughed, a collection of essays describing the various ways that the communist countries failed their citizens on the level of everyday life. Travelling throughout the region for Ms. Magazine, Drakulic learned that communism never managed to deliver on its promises, and its demise was met with laughter and hope for the bright democratic future to come. Twenty-five years later, Drakulic reflects on how women are faring in a postcommunist era that, like the communist era before it, has not delivered on its promises. Eastern European women aren’t laughing though because the endless limbo of postcommunism has undone many of the rights and entitlements women once enjoyed. Despite the ongoing hardships, Drakulic marvels that no feminist movement has taken advantage of the new democratic freedoms to challenge resurgent patriarchy. And why is there no movement? Drakulic blames young eastern European women’s current apathy on the lingering legacy of “emancipation from above”. On her view, even twenty-five years after its demise, communism still earns the blame for eastern European women’s lack of grassroots, feminist activism, because “the ideology of collective solidarity belongs to the past”. In other words, eastern European women can never have a real western-style women’s movement because communism has tainted the idea of mass mobilization for a cause. Communist governments made women into passive political subjects who supposedly wait for rights to be handed to them from above rather than going out on the streets to fight for them from below. But the historical reality is much more complicated than the myths would have us believe. Regarding the first fantasy, even in the West, political forces “from above” often influenced the contours of the women’s movement. Moreover, many of these public efforts came precisely because of a western perception that eastern European countries were successfully addressing women’s rights. President Nixon also established a Presidential Task Force on Women’s Rights and Responsibilities. It submitted its recommendations to the President in December 1969 and also argued that the United States was lagging behind other countries in its treatment of women. In both cases, the contents of the reports produced by presidential commissions established and working “from above” formed the basis of later women’s organizing in the streets. And while both Kennedy and Nixon might have personally had an interest in promoting women’s equality, the language used to justify this work was the language of the Cold War. The public image and foreign policy goals of the United States could not be properly achieved without some concessions on women’s issues. As Mary Dudziak argued in her brilliant book, Cold War Civil Rights, the success of the American social movements of the 1960s and 1970s might have been more about white, male American leaders trying to squash the spread of world communism than about the grassroots organizing of people “from below”. The second myth, that eastern European women were simply given equal rights by male communists, is also mistaken. It is true that Communist movements in the eastern European countries, from the beginning, included demands for women’s emancipation. But it is important to remember that legions of women fought actively beside men against the fascist powers during World War II, as soldiers in the Soviet Union and as partisans throughout eastern Europe. Many women were committed communists who believed that state ownership of the means of production would obliterate women’s economic dependence on men and grant them full citizenship in a new society of equals. Communist societies often failed to fully live up to many of their promises, promises of the emancipation of women included. But walking within the corridors of communist power were women, women who fought long and hard against male elites to realize the dream of women’s equality. The irony of the myth of “emancipation from above” is that it ignores the real contributions of communist women with political power just because they happened to be communists. In Bulgaria, for instance, archival research and oral history interviews have revealed that the Committee of the Bulgarian Women’s Movement, the mass women’s organization empowered to speak for women “from above”, engaged in countless battles behind the scenes to secure greater legal protections and social entitlements for women. Through letters to the state women’s magazine and women’s meetings held in towns and villages across the nation, Bulgarian women communicated their ideas and demands to the Women’s Committee “from below”. Their suggestions and complaints worked their way up to Party elites in Sofia. The Italian historian, Chiara Bonfigioli, has done extensive archival research to expose the grassroots participation of ordinary women in the Antifascist Women’s Front of Yugoslavia (AFZ), an organization founded during World War II to involve women in politics. 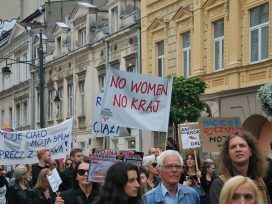 Many feminist activists across the successor states of Yugoslavia (and particularly in Croatia) are now reviving the legacy of AFZ in various ways. Francisca de Haan, a Dutch historian, has uncovered the broad international constituency of women that supported the work of the Women’s International Democratic Federation (WIDF), an organization long decried as a “communist front” organization by the United States. Today, there are at least a dozen historians and anthropologists working on communist era women’s organizations to challenge the fantasy that all women’s organizing came “from above” in eastern Europe. One point on which we absolutely agree with Drakulic is that there are no popular women’s movements in eastern Europe today, nor indeed are there significant mass social movements protesting the dismantling of the what she calls the welfare state (although we have to be cautious in applying this concept to the former Yugoslav context where welfare states never properly emerged after 1989) and the imposition of austerity. But we would offer a somewhat different explanation. Drakulic believes that “The biggest barrier to women’s political participation may not be legal but cultural”, but we believe that the biggest barrier to women’s political participation is something else. We would suggest that that the biggest barrier to active mass social movements derives not from a Communist past but from a neoliberal present. 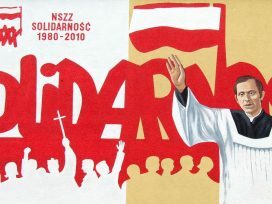 Drakulic is unfortunately quite correct that the ideology of collective solidarity belongs to a bygone era. But this is not only the case in the post-communist countries of eastern Europe – as showcased, perhaps inadvertently, by the last part of her essay. 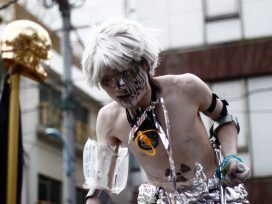 In the western democracies, the hyper individualism of late-capitalist consumerism and post-modern identity politics conspire to focus our attention on our own material needs and desires for personal actualization. In a social world that values competition and rewards self-interest, there are few incentives for collective action beyond the occasional nationalist or religious ones. 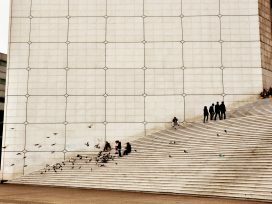 In an economic system that creates scarcity and vast inequalities between rich and poor, it makes more sense to focus on getting ahead, or at the very least on ensuring that you don’t fall further behind. What we need in eastern Europe today, and indeed across the globe, are not myths of what is or isn’t “real” women’s organizing. We need new ways to imagine a future that is as good for women as it is for all peoples marginalized or disenfranchised by the savagery of neoliberal übercapitalism. 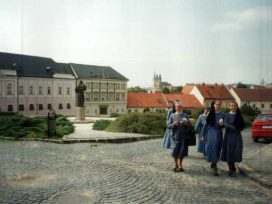 Nitra is a small city of around 78,000 in western Slovakia, nestled at the foot of a castle-crowned hill. A walk down the main drag, Štefánikova Street, paints a picture seen across provincial former Habsburgia: there’s brand new infrastructure, shiny new buses but no jobs. Since December 2015 a small group of Christian refugees from Iraq have called this small town their home away from home.